If you love Disney’s The Lion King, you probably love lions too. These big cats really do seem royal. Lions are the biggest of the big cats after tigers. Most males weigh around 400 pounds, while females weigh around 290 pounds. The biggest lion ever recorded weighed over 800 pounds! That’s like four of your dad! Most lions nowadays live in special reserves in Africa. These are places set aside for them where they cannot be hunted or hurt. Less than 300 Asian lions live in the Gir forest in India and another 200 live in zoos. Lions are an endangered species. Lions live in groups called PRIDES. Lions are the only cats that live in groups called prides. A pride has several females, their cubs and a few males. The females do most of the hunting. They work together to bring down prey. This keeps them safer than if they hunted alone. Males have an important job too. They patrol their territory and protect the young cubs. They also make sure cubs get enough food. Male lions have manes. These manes protect them during fights with other lions. Lions are carnivorous. They eat almost anything including antelopes, buffaloes, giraffes, crocodiles, baby elephants, lizards and bugs. They sometimes steal food from other big cats. Lions spend a lot of time napping – up to 21 hours each day! All About Lions: The female lions do most of the hunting. A Male lion with manes that protects him while fighting. Question 1: How fast can a lion run? Answer 1: Lions can run very fast for brief periods. A lion can run the length of a football field in six seconds! 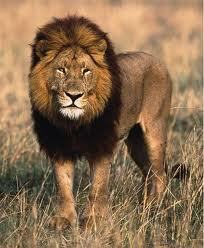 A lion can run up to 50 mph but only for a very short distance. Question 2: How do lions take care of their babies? Answer 2: Male lions watch the cubs while mothers hunt. All the mothers care for and feed babies – even those that aren’t their own. Question 3: Do lions drink anything else aside from water? Answer 3: Yes, they eat wild melons when water is scarce in order to get moisture and avoid dehydration. Question 4: Do Lions live together or Alone? Answer 4: Lions live together and are very social. A family of Lions is called a Pride. 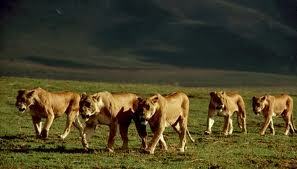 The Pride is headed by a dominant female member. Question 5: What are baby Lions called? Question 6: What do Lions Eat? Answer 6: Lions love meat and have to have it to survive. 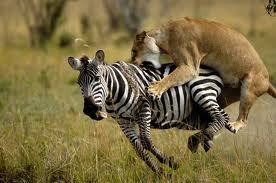 In their habitat lions hunt and eat the following – Zebra, Buffalo and even Elephants. 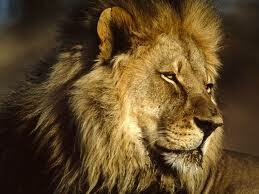 A lion will eat almost anything they feel they can overpower, so nothing is too big for a lion to attack. They don’t always succeed with the likes of Elephants and Rhinos but they keep on trying. It goes without saying Lions will eat almost anything that contains meat. Question 7: Have Lions got any predators? Answer 7: Yes Lions have predators and unfortunately its us. Lion hunting or Trophy hunting as it is known is still going on today under licence in countries like Zimbabwe and Namibia. It is a shame because there are less than twenty thousand wild lions roaming the African continent (2016) and that compares to over 1.2 million back in 1880. Enjoyed the Easy Science for Kids Website all about Lions info? Take the FREE & fun all about Lions quiz and download FREE Lions worksheet for kids. For lengthy info click here. Declan, Tobin. " Lion Facts for Kids ." Easy Science for Kids, Apr 2019. Web. 21 Apr 2019. < https://easyscienceforkids.com/all-about-lions/ >.